It’s 1781. While the Revolutionary War winds down east of the Allegheny Mountains, in western Pennsylvania, a tribe of Delaware Indians take to the warpath. A 19 year old girl, Rebecca Walker, witnesses the killing of her parents and brother by a raiding party and is captured herself. After unsuccessful escape attempts, she falls in love with a member of the tribe, Mamalachgook. She convinces him to run away with her; but further adventure awaits Rebecca. The birds stopped singing. Rebecca just noticed. The Western Pennsylvania woods, normally alive with the music of the Scarlet Tangier, Oriole and Bluebird, now were strangely silent. A shiver propagated through Rebecca’s nineteen-year-old body. She gathered her shawl about her shoulders. Although the spring of 1781 had barely arrived in Westmoreland County, until now, Rebecca had felt warm enough in her wool petticoat and shortgown. It was the thought of redskins that made her shiver. Visiting neighbors had brought stories of Indian attacks in other townships. Although she had previously thought the bloody stories to be exaggerated, violent visions flashed through her mind. It was now quiet, too quiet! How long had it been that way? Had the birds just stopped singing, or had it been that way for some time and she was just realizing it? Could they be watching her right now? Maybe it wasn’t Indians. Could it be an animal? What kind of animal would frighten birds? A panther perhaps? No it had to be human. She’d best make for the cabin. The berry picking could wait until she was sure all was right at home. With only a single layer of berries in the bottom of the basket, she brushed back her red-brown hair and headed for the cabin her father, Henry Walker, had built when she was but five years old. Rebecca had taken but a few steps when the report of a rifle rang out. Her mother’s terrified scream followed the rifle, then the blood curdling whoops of savages. Rebecca dropped the basket she carried and ran toward the cabin. She paused by a beech tree at the clearing. Before her, just outside the door to the one and one half story log cabin, her mother knelt, bent over the prostrate body of her father. Two of the Indians held fast her 14 year-old brother, Philip, who struggled with all his might to free himself from his muscular captors. Two more Indians rushed upon her mother and snatched her away from her husband, whereupon another scalped her father. Rebecca’s mother, upon seeing this last act, broke loose from her captors, her internal rage providing the needed strength. Before the Indians could lay a hand on her, she swung the ax, bringing the blade down into the closest Indian’s skull. Rebecca watched in horror as her mother tried to draw back the ax to strike at the second one. Her mother wasn’t fast enough as the second Indian fell upon her and tomahawked her, rising with her mother’s bloody scalp in his hand. Overcome with grief, Rebecca let out an involuntary shriek, which drew the attention of all the living at the cabin to her direction. Philip spotted her first and cried out. Rebecca darted back into the woods. Which way should she go? West, toward Fort Pitt, but that was so far away. Nevertheless, she was helpless against the redskins, having no weapon. Surely the militia commander at Fort Pitt would send troops to free her brother. Her brother, what would the Indians do with him? If she went for help at Fort Pitt, it would be days getting there and days to return. The Allegheny woods would swallow up Philip and his captors and she may never see him again. She had a more pressing problem, however, for now she could hear the rustle of brush and twigs snap behind her, meaning the Indians were closing fast on her. She spotted a dark silhouette, not a person, but a dense growth of plants to her right. It appeared to be a mass of thorns and briars. It flashed into her mind that her brother liked to hunt rabbits in this sort of brush because as he had put it. Without considering the matter further, Rebecca made for the cover, diving to the ground and crawling into it. She stayed low, hugging the ground. She squirmed and twisted like a snake, the thorns tearing at her face, hands, and clothes. She stopped and hugged the ground, wishing somehow she could bury herself within the earth. Then came the crunch of brush as her pursuers arrived. She saw only one pair of moccasins, but heard two voices. The sounds from the two Indians began to recede, indicating they were leaving. Cautiously, Rebecca began to raise herself up from the prone position she’d been in. She wiped spider web from her face and knelt back on her heels for a moment. Not hearing anything more, she slowly untangled herself from the briar. Standing up, she spotted a deer trail a little to the right of the briar patch. So that’s where they went, she thought. It made sense that they assumed a white woman would have followed a trail, any trail. What to do now? She first thought of returning to the cabin to bury her parents, but then there was her brother. He might still be alive. The Indians must have wanted him for a prisoner or they would have killed him before she’d arrived on the scene like they did her father. Maybe she could find him, but how? Then she thought of the two redskins she’d just closely encountered. Yes, sooner or later they would rejoin the ones who held her brother. She started down the trail to follow them. After about twenty or thirty paces, she spotted the silhouettes of two moving figures in the trees before her. She halted. They were coming toward her! She quickly ducked behind a white oak tree. Quietly she slid to the ground to take advantage of the additional cover of the forest understory. The two Indians passed by her without taking notice. She waited a few moments; then rose to her feet and inched forward. Keeping in the cover of the understory, she observed the Indians. They had stopped by the mass of briars and thorns, which had formerly been her refuge. One of the two cut a sapling with his tomahawk and used it to probe the dense vegetation. A few moments later, apparently satisfied that their quarry wasn’t there, one shrugged at the other and they headed back toward the cabin. Rebecca followed, keeping behind them far enough that she could barely see the dark silhouettes of their bodies in the forest foliage before her. The Indians did not return to the homestead. Instead they were met on the way by the rest of the party who had attacked Rebecca’s home. Rebecca was close enough to determine two were escorting Philip, two were carrying the body of the Indian her mother had slain on a hastily constructed bier, and the other carried her father’s flintlock, power horn, and bullet bag, as well as a sack which she surmised contained anything else the redskins had deemed valuable enough to pilfer from the house. Her brother’s arms had been wrapped around a pole and fastened to a strap in front, making it easier for his captors to control him. The two Indians who had chased Rebecca exchanged a few words with the others then fell into a more or less single file line, one taking the lead and the other at the rear. Again Rebecca followed, determined to find a chance to free her brother. Rebecca managed to follow this part, uphill and down, through forests, streams and thickets until they decided to make camp at dusk. She was hungry, having not eaten since breakfast that morning, and tired. She longed to sleep on her feather mattress and pillow; she’d made with her own hands. The image of her mother being slain burned in her mind and kept her awake. She silently cried at the thought that her mother would no longer be there to comfort her. Just yesterday, in fact, her mother told her that rumors of Rebecca’s beauty were being spread throughout the valley. Rebecca’s father had commented something to the effect that he had enough to do and he didn’t need the added trouble of dealing with every eligible bachelor in the country coming around and making a nuisance of himself. Now, two of the people she loved most dearly were dead. The third was a prisoner in the hands of these murderers. No, there was no sleeping tonight! Rebecca found a spot at the edge of the Indian encampment where she could observe without being observed. Leaning against an oak tree, she saw two of the Indians disappear into the brush on the far side of her. She assumed these went off to hunt meat for their supper. In the meanwhile, the two who had carried their dead companion set him to the side of the trail. Rebecca noted that a blanket, undoubtedly stolen from her cabin, covered the dead body. These two headed toward the brush with tomahawks in their hands. Rebecca froze for a moment, thinking they had spotted her; but they entered the woods a little to her left and set about cutting some saplings. The redskins were dressed in deerskin shirts, with leggings and moccasins to match. Their faces bore strange painted images. One appeared to have the head of a woodpecker while the other that of a hawk. From her vantage point, Rebecca soon learned the purpose of the tree cutting. They cut a pole about the thickness of a man’s thigh and hollowed notches into it. Then they untied Philip’s hands from behind his back and retied them in front. They made him lay on the ground on his back and put the log with the notches over his ankles. To hold this log in place they lay poles, with the diameter of a fat sausage, on either end of this log. These poles they held in place by stakes made from branches where the notch created by the branch held the pole in place. Then they wrapped a strap around Philip’s neck and fastened it to a tree. Rebecca watched as Philip tried to squirm loose, but he was effectively confined to his back. By this time, one of the other Indians had built a fire, and all the others set about gathering dead sticks to feed the fire. As darkness began to settle in, the two Indians returned, carrying the lifeless body of a doe on a pole between them. All the Indians joined in the work of dressing and butchering the deer. Before long, the smell of roast venison permeated the air, causing Rebecca’s stomach to knot with pangs of hunger. A little later, as the redskins gathered around the fire to eat, Rebecca noted that Philip was unattended; but the fire illuminated the night camp enough that she would surely be spotted if she tried to get near him. She would have to wait. Her best chance would be after dark. She huddled herself next to the tree, trying to cover as much of her body as possible with the tree and her shawl, for a chill descended with the nightfall. As she watched the Indians enjoy the warmth of the fire, rage rose within her. This aided in the fight against the cold. As the noise of the night took over, the crickets, and a distant howling of a wolf, Rebecca’s eyelids grew heavy. In her effort to stay awake she plotted the rescue of Philip. She decided together they would do west to Fort Pitt. She and Philip would lead soldiers back to handle these murdering savages; but what then? She was afraid to return to homestead. Sure, she and Philip could rebuild. Philip was strong from cutting wood, threshing grain and other farm chores. It wouldn’t be long before he would be able to handle the chores as well as any full grown man. Rebecca was afraid to stay at the homestead though. These savages would show up at any time and destroy the two of them as they did her parents. As she pondered her brother laying at their mercy in the darkness, Rebecca suddenly felt remorse for every wrong, real or supposed she’d ever inflicted on her brother. For instance there was the time he stuck a frog down her dress. He’s managed to sneak up on her and drop it down her dress at the back collar without her knowing what it was. When she felt the wet slimy flesh, she screamed and nearly stripped herself naked to be rid of it. Her father, upon hearing her screams, came running to what was wrong. When her father observed the scene and Rebecca told him what happened. Her dad “wailed the tar” out of Philip. Philip hurt so bad that it pained him to sit down for a week. Surely Philip must be enduring the same sort of pain right now, only it was worse. For presently the worst was likely to come and fears of all manner of tortures must be coursing through his mind. Rebecca envisioned that sandy-haired face of a boy grown, but not yet a man. Just this morning she’d made a comment about the wisp of a mustache growing under his nose. She said. In response Philip muttered some insult about her having a face like a horse and that her father probably should take her to a fair and trade her for a better looking one (horse). Rebecca had been searching her mind for some equally nasty reply when her mother called her away to help with breakfast. It was amazing how her world could be turned upside down between dawn and dusk! Rebecca looked back toward the fire. All the Indians save one appeared to be asleep. The fire burned low. Apparently the deerskin clothes the redskins wore provided adequate protection against the night chill. Rebecca scrutinized the lone Indian sitting up. He was rocking back and forth in a rhythm not unlike a slow pendulum. Could it be he was dozing off and might not notice if she moved to her brother? She decided to chance it. Rebecca moved silently. Creeping on all fours, she lifted each hand and knee in turn and carefully set them back down again. Her progress was agonizingly slow. On the edge of the brush, she lay flat and crawled like a snake. She crawled up alongside her brother’s ear and whispered. Philip nodded that he understood. Rebecca worked on the strap that held him by the neck first. She suddenly remembered something. She dug into her “pockets” and found a scissors she had there. Actually it was her mother’s scissors; but she had been doing some sewing yesterday and forgotten to return it to her mother’s sewing box. With she went to work on the rawhide strap. After a few strokes, it separated, freeing Philip’s neck. She slid down opposite his body and went to work on the strap that bound his hands. The Indian by the fire stood up. Rebecca froze. The Indian started to come toward them. Rebecca wasn’t sure whether to make a dash to escape now, or stay motionless and hope he wouldn’t come any closer. She held still. That was the right decision. The Indian stopped to pick up a couple of sticks to add to the fire and turned with his back to them as he fed the sticks into the fire. Rebecca saw this as a great boon. She decided to abandon the bond on her brother’s hands in favor of releasing his legs first. She moved to where the first stake held fast the pole holding the log across his legs. She wiggled it back and forth until she was able to start working it upwards out of the ground. With effort it was soon removed enough that she could slide the pole out. She crawled over to the other side and started working on it. A few moments later, her efforts were rewarded and she removed the second pole. She lifted off the log and Philip’s legs were free. He started to sit up, but she squirmed up alongside him and pushed him back down. “Let me cut the bonds on your hands first. Then crawl out; follow me and don’t make a sound.” She instructed. Rebecca went back to work on the strap that bound her brother’s hands. Her eyes darted toward the fire from time to time to check on the solitary guard. He was squatted with his back toward them – Good! She had to take more care not to stab her brother with the scissors as she worked to cut the strap, but finally the scissors cut through and Philip unraveled the strap from his wrists, rubbing them afterwards. “Let’s go,” Rebecca whispered and rolled over on her stomach, crawling toward the brush again. She now was facing away from the Indian at the fire and wasn’t aware that he’d moved to the far side to avoid some smoke as the fire began to regenerate. The Indian now faced them again, and the new fuel burned brightly again, illuminating much more of the area than before. About the time Rebecca became aware of the additional light she heard. “Pennau!” the Indian shouted and darted toward them. Rebecca looked back over her left shoulder to see the rest of the Indians scrambling to their feet. Philip followed her command and ran for the woods far to her left. Rebecca pressed straight ahead, fighting her way into the brush. She frantically pushed the branches aside before her as though swimming through a field of vegetation. In the darkness, she struggled to bury herself in the dense foliage of the forest. In a few moments, the snap of branches and rush of leaves told her she was being pursued. She dare not look back now; to look back would waste precious seconds and she was afraid of what she would see. No, she must press on. Perhaps she was drawing the Indians away from her brother. At least it would be some compensation for Philip to escape. Well they hadn’t caught her yet either. Maybe she had a chance. Then it happened. She tripped on a root or stone protruding from the ground and went down, face first, sprawling on the earth below. As Rebecca started to push herself to her feet again, two mighty hands grabbed her arms just below her shoulders. She was lifted into the air and set back on the ground; but the hands didn’t relax their grip. She was turned to face an Indian with white stripes painted on his face across the cheeks. The Indian withdrew a knife from a sheath on his belt and reached for Rebecca’s hair. “Atta ta,” the Indian restraining Rebecca shouted at the one with the knife. 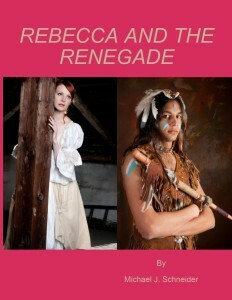 Rebecca watched as the Indian, who was about to scalp her, returned his knife to its sheath in disgust. The Indian holding her then addressed Rebecca. Realizing the futility of trying to fight when one Indian held her arms fast and the other was ready to kill her, Rebecca answered. With this commitment, the Indian who held her, turned loose of her arms and shoved her in the middle of the back. The Indian in front of Rebecca turned around and started back through the brush toward the campfire. She followed him, not wanting to look back at her captor. She cringed with disgust at the thought of what she might be expected to do as his “squaw”. There had to be some way to escape, and she was determined to find it. For now, she would try to be cooperative in the hope that they might relax their guard. When they reached the clearing that was the campsite, no one else was there. Rebecca’s heart leapt for joy. Apparently, Philip was leading the others on a merry chase. She knew her brother could run. He might just outrun them all together! “Lie down here,” the Indian who captured her ordered. Rebecca looked down and noticed she was now at the same spot where her brother had been trussed-up for the night. She did as ordered, and the two Indians began to secure her legs as they had her brother. When the Indian who captured her came to bind her hands, she noticed he did not look as fearsome up close as she imagined he would in the woods. He was younger, perhaps only a year or two older than her. His face was painted also, but only a couple of streaks on either side of his forehead and several concentric circles on his chin. The skin stretched taunt over the bone like a deer’s hide over a deer’s hind legs. This almost “human” appearance prompted her to ask. Her captor moved to fasten the strap around her neck. “But you killed my father and mother and now are after my brother,” Rebecca responded, reduced to tears as the vision of her mother being scalped flashed across her mind again. “No more talk.” Her captor said and left to join the other Indian at the fire. Rebecca lay in the dark, just staring at the star filled sky for a long time. Fatigue was taking its toll now and she was beginning to drift off to sleep when the noise of other Indians returning to the camp awakened her. She rolled her head to the right. In the darkness she could only see silhouettes. Two Indians returned to camp. She could tell by the crown silhouette formed by the feathers on their head. She started to sigh with relief; but the sign aborted when she saw two more Indians enter, pushing Philip before them. Before long they had Philip staked out on the ground alongside Rebecca. When the Indians had finished securing their new prisoner and left, Philip spoke to Rebecca. “I tripped on a tree stump or something, fell flat on my face. They had me before I could get up again.” Rebecca explained. “What do you think they will do with us, Becky? I’ve heard rumors they torture prisoners.” Philip asked anxiously. “Let’s try to sleep then. We’ll need all the strength we can muster to deal with these barbarians.” Rebecca admonished. To Rebecca’s surprise, sleep did come. She didn’t dream, but was awakened by the Indians releasing her from her neck and leg restraints. She opened her eyes and found she was staring into a blue sky. “Get up,” a voice barked. Becky rolled over to her knees and stood up. She looked around her. The Indians were all standing in line, more or less, ready to travel. Two of them had Philip between them up front. They were followed by the two carrying the litter with the body of their dead companion. Rebecca’s captor held a ling strip of roasted deer meat before her. “You take. Eat. Day’s journey long. Don’t want white woman to faint before we reach village.” He said. “The name is Rebecca,” she said indignantly. Her captor then took hold of Rebecca’s shoulder. He first pulled her toward him; then pushed her ahead of him. Rebecca started walking behind the Indian who had wanted to scalp her last night. Rebecca felt offended because the remark her captor had just made seemed to hurt as much as the loss of her parents. Although it was awkward, she began to nibble on the strip of dear meat. She was so hungry that she thought it was the best thing she’d ever tasted in her life. She tried to savor it, not knowing when, or if, she would ever eat again. The hike was rigorous. Rebecca wondered how fast they would have gone if they didn’t have the dead Indian. She noticed that each member of their party, including her captor, took turns carrying the litter. By the time the sun was at its highest position in the sky, Rebecca was now parched with thirst. They began to travel a path where the ground squished under her feet. The Indian party stopped. Rebecca watched as her captor, like the others, stopped, took out his knife and dug a small hole in the ground. Water oozed into the hole, murky, brown water. “You drink,” he said and motioned toward the hole. Rebecca, repulsed at the muddy liquid, hesitated. But, as she paused, the murky water began to clear up. She dropped to her knees, bent forward, putting lips to the water surface and sipped the liquid. It tasted as cool and sweet as any water she’d ever tasted. She drank and drank until she felt her sides would burst. “You drink like horse, not like woman,” her captor commented. “When she rose, he took a drink from the same hole. Rebecca noted he took several modest swallows and stood up. “We go again,” her captor prodded, pointing to the other members of the party who were on the move again. A little before sundown they reached the village. Rebecca’s first impression was that she had arrived in a land of giant turtles. This was what the Indian houses looked like. As they entered the village amongst cheers from its inhabitants, she could see that the houses were made from poles, buried in the ground at one end and bent over and tied together. Upon this frame were sheets of bark or thatched reeds. A hide hung over a single doorway. Women and children piled out of many of these to see what the excitement was all about. The Indians in her party then gave a bone-chilling yell. It sent shivers racing through Rebecca’s body. After this, the men, women and children of the village lined up in two lines alongside each side of the path of the party. Rebecca suddenly noticed some had sticks and some had tomahawks in their hands. The two Indians escorting Philip took him to the head of this path between the two lines of Indians. They removed all his bonds. “You see that painted post in front of the large lodge before you?” One of the Indians asked. Rebecca looked to see what they were talking about. Just in front of the largest of the shelters in the camp, she saw a thick round pole, painted mostly in white, but other colors besides. “If you want to escape torture, you must touch that post.” The Indian continued. Philip started to take a step forward. An old squaw raised a stick to strike at him. “But those on either side of you have lost loved ones to the whites. They will do their best to see you don’t make it.” The Indian continued. With these words both sides of the parallel lines of people let up yells and whoops, nearly as chilling as the war party had done when they entered the camp. Her muscles tense, Rebecca watched her brother. He nervously looked at one side of the two columns of Indians, then the other, then at the painted pole. He took a step and hesitated. Both sides raised their weapons and lunged forward a little. Philip stopped. Both sides leaned backward again. Philip, apparently pleased in having faked the run for the pole repeated the move. This time, however, when the two sides started to back off, Philip ran for the pole. He made it three fourths of the way down the perilous aisle with hardly a blow landing on him when it happened. He fell. What tripped him up was not clear to Rebecca; but she watched in terror as the bloodthirsty mob fell upon her brother. She shrieked and ran for him. An old Indian who had been watching the challenge shouted. Whereupon the crown of Indians parted, leaving the motionless body of Philip face down in the dirt. Rebecca dashed for her brother and dropped down on her knees beside him. She rolled him over. His face and skull were covered with bruises and cuts. Blood oozed from the corner of his mouth. He opened his eyes and tried to smile when he saw Becky looking down at him. “Close doesn’t win anything in this game, does it?” he said. Then his eyes took on the blank stare of the dead. “Oh, Philip,” she sobbed and held her head next to his. “He was a brave lad. We will give him a warrior’s funeral.” The old Indian’s voice came from behind her. She looked up, rage in her eyes. The chief then motioned to two men who took hold of Rebecca and stood her up, backing her away from the body of her brother. He then motioned to two more; who came and carried off Philip’s body. “Where are you taking him?” Rebecca demanded. The chief then motioned with his hand and two women, about Rebecca’s age hastened over to the chief. He gave them some instructions in their native language. When the chief finished, the daughters each took Rebecca gently by the upper arms and led her to a small stream behind the bark-covered lodges of the village. There they removed the bonds from her hands and gestured for her to wash. After Rebecca washed her face and hands, the two Indian maidens led her back to the great lodge. There they motioned for her to sit on a log and brought her a bowl of corn soup. Rebecca devoured this. As she ate, she observed that the chief’s daughters seemed to be pleased to see her eat so ravenously. While Rebecca ate she surveyed the village around her. The Native Americans sat in various little groups around several campfires. One group in particular captured Rebecca’s eye. It was a group of braves who sat, engaged in animated conversation, around the roasting hindquarter of a deer. From time to time, one of the braves would go over to the hindquarter and slice off a strip of meat with his knife. Then he would sit back down and continue in conversation with the others. The Indian who had captured her was among this group; but he was not the reason for her interest. Another Indian of the group kept looking at her. Even sitting, this Indian bore a tall, straight posture, with a dignity Rebecca would have associated with a noble. He was hardly dressed like a noble though. His chest was bare except that a pouch hung, suspended by a rawhide cord around his neck and a cape made of raccoon shins was draped over his left shoulder. He wasn’t as heavily muscled as some of the other braves; but every contour and striation of muscle was visible through the skin. He wore a breechcloth with leggings. These covered his legs, but left part of his rear exposed where neither the breechcloth nor leggings covered. Although most of the braves wore the same breechcloth and leggings, seeing this particular man dressed so sent an embarrassing sensation through Rebecca. Then there were those eyes. They seemed to penetrate Rebecca’s soul although they were at a considerable distance from her. In contrast to his fellow braves, this man wore no paint on his face. Perhaps that was why his face looked almost handsome. The others had strange, multicolored symbols on their foreheads and cheeks, which Rebecca found revolting. Realizing she was staring at him, Rebecca quickly turned her eyes away. Having done so, she was quite unaware that he had done the same. One of chief’s daughters giggled. Rebecca gave her the evil eye. To Rebecca’s surprise she spoke back to Rebecca. “That one is Mamalachgook. I think he likes you.” She said. “Until ten summers ago, we lived in a large village with many Lenape. It was in the land of the Miami, near the Tuscarawas River. We traded many furs with the whites. Nearly all in the village learned the language of the whites.” The Indian maiden explained. When darkness came, the chief came and told Rebecca she could sleep in the lodge that night. One of the chief’s daughters took her inside and showed her to a deerskin covered bunk. Rebecca lay down on it and was soon fast asleep. She was awakened in the morning by one of the chief’s daughters and the two daughters led her to the stream again where she washed. Returning to the lodge, the two Indian maidens sat her on the log in front of the lodge while they combed her hair. Rebecca could see the people were gathering in the center of the village. In a few moments the chief came out of the lodge. He looked at Rebecca and spoke. “We now go to bury the dead,” he announced. The chief then walked directly toward the crowd in the village. The chief’s two daughters led Rebecca behind the chief. When he reached the crowd, Rebecca saw two coffins constructed of logs and bark, much like the wigwams. The chief led the funeral procession from the village. Behind him, bearers carried the two corpses in their coffins. Rebecca and the chief’s two daughters followed the coffins along with another squaw, whom Rebecca assumed was the wife of the dead Indian. Behind them it appeared that the whole village had turned out for the funeral. The chief led them to an area in the woods where two graves had been prepared. The people of the village gathered in a semicircle around the grave. The bearers took the lids off the coffins. All sat on the ground in silence for an hour or so. At the end of this period, the bearers put the lids back on the coffins and lowered them down into the graves. As they did this, three woman mourners ran forward and began to shriek and wail, plucking at their garments and tearing at their hair. After this demonstration, the coffin bearers laid two poles lengthwise and close together over the graves; then left. The squaw whom Rebecca assumed to be the wife of the deceased Indian, walked across her husband’s grave on the poles. One of the chief’s daughters gestured in the direction of the graves indicating Rebecca should do the same on her brother’s grave. Rebecca did so. Glancing down at the coffin of bark below as she passed over it. Next a painted pole with figures on it was passed along the men at the front of the village, one to another. Then one took it to side of the grave which faced the rising sun and placed it on the coffin of the fallen warrior, holding the pole upright in place so that it rose a little ways above the ground. After this the chief turned to Rebecca. “Do you want to place some remembrance of your brother’s life on his coffin?” he asked. Rebecca went to the forest edge and found a pole and shorter stick. Using some wild grapevine, she lashed these together in the form of a cross. Taking it to the grave, she lashed these together in the form of a cross. Taking it to the grave, she placed it on Philip’s coffin and left it there. The women of the village then filled in the graves with hoes. When they reached the original ground surface, the women took great care to cover the gravesites with twigs, branches, and leaves, so that none of the fresh ground was visible. After this some men, using poles previously prepared for the purpose, built a chest high fence around the graves. The ceremony over, the people of the village began leaving. Rebecca knelt at the gravesite for a while, thinking about her brother and praying for him. She became so engrossed with memories of him, that she didn’t notice for a while that she and the chief’s two daughters were the only ones remaining at the grave site. Once she realized this, a plan of escape formed in her mind. She went to the forest edge and gathered azalea branches. She sat on the ground and began weaving them into a wreath. The two Indian maidens, seeing what she was doing, went into the woods and started to gather more branches. When Rebecca saw that they had their backs turned, she darted for the trail they had traveled from the Indian village to the gravesites. About halfway down the trail, she ducked into the bush. She waited there a few moments until the two girls came running down the trail looking for her. As Rebecca had hoped, they ran past her toward the Indian village. She came out of the brush and headed back to the gravesites. When she reached them, she entered the woods on the far side. She saw that ground sloped down before her and then rose again, rising higher on the other side of the ravine. She shoes to go that way, although she knew crossing the ravine might leave her exposed to view longer than traveling either to her left or right. Rebecca was more worried that she might accidently run into the village or one of its inhabitants if she didn’t go straight ahead. The ground on the near side of the ravine was steeper than she thought and her feet slid out from under her once as she made her way down it, causing her to slide, rather undignified, on her bottom several feet down the hill. Going up the other side also proved more difficult than she originally surmised. It was steep and the forbs covering the side of the hill still contained some dew. Rebecca had to grab branches of trees and the stems of shrubs to help pull herself up. When she finally reached the crest of the ridge, she was panting and sweating profusely. She longed to sit a moment and rest, but she had to content herself with walking up the flatter slope to her right. She decided now that she would stick to the rising ground in the hope that it would eventually lead to some vantage point where she might determine a direction to follow to safety. Rebecca continued her uphill trek, not reaching a peak until it was dusk again. She found a flat bit of ground, concealed by switch ivy and fetterbush. She lay down. Hungry, but exhausted, she fell asleep. She was awakened the next morning by the call of the Bobwhite. She got up and brushed herself off. Lord! She was hungry. Never mind that, she was still free, even if she had no idea which way to go. She found her way to a clearing and discovered on the other side of it a rock outcropping that gave her a view of the land for many miles distant. She saw a variation in the vegetation with a sinuous pattern that indicated it might outline a creek. Thinking this to be Loyalhanna Creek, she decided to make for it. After several hours she came upon the creek. It was well protected at this point by forest canopy so she decided to pause for a long drink of water and a short rest. She spotted a berry bush on the far bank and ravenously stripped it of its fruit, both ripe and not. She recalled how good the Indian corn soup tasted; but resolved that death from hunger or wild beasts would be preferable to being a slave to an Indian. She would take her chances in these woods. She was also determined to reach Fort Pitt in the hope that the commander there would send men to destroy the village of those who killed her mother, father and brother. Renewed in purpose, she followed the creek for the rest of the day. As the shadows began to indicate daylight was waning, Rebecca was suddenly startled by a loud crunching sound in the brush. Thinking it might be an Indian war party or one searching for her, she ducked behind a large chestnut tree. Slowly, she slid around the tree until she could view the portion of forest where she heard the noise. Then she discovered what had made it. A large mother bear and her cub were ambling through the forest. The mother bear stopped, rose up on her hind legs and sniffed the air. Would it come after her? No, it headed away, the cub toddling along behind. Rebecca became more and more hungry, not seeing any edible roots, finding few berries and having no weapon to secure meat. Weak and tired of wandering, she came to an area where she thought she heard the sound of rushing water. She moved toward the sound, climbing over numerous high rocks, she finally came to the edge of a great river. She followed along the bank some 15 or 20 feet above the river. Eventually this led her to a point where a high perpendicular rock formed the bank on one side of her. She continued alongside the mighty landform until the bank ended abruptly, overhanging the river. Rebecca looked up. The sheer face on the rock would be impossible to climb. She looked to the way she had come. The thought of retracing her steps to where she could get above the rock utterly depressed her. She walked to the edge of the precipice. It was a long way down; but perhaps not so far, it would be much easier following the course of the river below. She said a prayer, closed her eyes and jumped. The free fall through the air seemed unusually long for the short distance that she traveled. She went deep, her feet striking on the river bottom. The shock of the cold water didn’t hit her until she resurfaced. She stretched out on the surface of the water, being somewhat stunned from the fall, she was content to drift with the current for a while. Rebecca then spotted a bend in the river downstream. Good, she thought. The current should take me close to shore. Rebecca lay forward on the water and began to stroke with her arms and legs in the fashion of a frog. Her mother had taught her to swim like this when she was quite young. Rebecca’s water soaked dress, pockets, and petticoat tended to pull her down; but she dare not discard any of them. It was all she had in the world now. Rebecca struggled to keep her head above water as the current sped her downstream. Closer, closer, she neared the riverbank. Just as she was about to stroke crosscurrent toward shore, she noticed it – a dugout canoe! Rebecca’s first impulse was to go for the canoe, thinking she could steal it and travel downstream in it. The appearance of two figures emerging from the forest fringe dashed this hope, however, Indians! Rebecca stroked back toward midstream, desperately hoping the Indians hadn’t spotted her. Luck was not with her. Shouts from the shore, followed by the two figures pulling the canoe toward the water, confirmed they had seen her. Rebecca sized up her options. Did she have a better chance of out running them in the water or on land? The current would give her a pretty good lead; but with two Indians paddling the canoe, how long would it be before they overtook her? If she could use her head start advantage on land, at least the forest might hide her. Rebecca drifted around the bend and the current now began to draw her toward the opposite bank. She rolled over in the water to glance behind her momentarily. No sign of her pursuers for the moment. They were still on the other side of the bend. She considered that the Indians being out of sight gave her a slight advantage. She swam hard toward shore. Her efforts were rewarded as her feet found the muddy ooze of the river bottom. She plodded toward shore. As she stepped up onto the dry soil, she glanced over her shoulder. The dugout canoe was rounding the bend. The sight of the canoe provided the extra burst of energy Rebecca needed to break into a run. She darted into a stand of beech and buckeye trees. The undergrowth was thick; but Rebecca spotted a deer trail and chose to follow that for a while. Rebecca wanted to move away as fast as she could. As she scurried down the trail, rustling through the brush as she went, an idea struck. Yes, it just might work. Rebecca turned and looked behind her. The impression of her shoe was clearly visible among the two-pronged deer hoof prints. Good, that fit in with her plan. She ran a few more paces down the trail then jumped, both feet together, into brush. Sticking to the forest understory, she began to make her way back the way she had just come. Rebecca moved cautiously this time, stopping every dozen paces or so to listen for the sounds of Indians following her. She continued this way for some time, until she was sure she was almost back to the river. In fact, she could hear the rush of water in the distance. Could it be they decided not to follow her? As if in answer to her question, she heard, she heard the swish of a branch, then another. Rebecca ducked behind a beech tree, then slowly peered around it. She could see the two Indian figures, barely visible through the brush, making their way along the trail. Her heart pounded. She backed around the tree, flattening her back against it and breathing in deeply, both to calm herself and to summon her courage for the task ahead. A moment later, she looked down the trail again. Yes, they seemed to have disappeared again. She must move fast. She made for the trail and ran down it toward the riverbank. Speed was most important now. She didn’t worry that the Indians might hear her rustle down the trail. When she finally broke through the brush to the riverbank, her heart stopped a moment. She didn’t see the Canoe! Frantically, her eyes scanned the riverbank, both upstream and down. Ah, there it was. The Indians had pulled the canoe all the way up into the brush. Rebecca darted to the location of the canoe. She grabbed it and pulled. The canoe didn’t budge. She set her feet and strained. It slid a little. She ran around to the other end, placed her feet against a couple of saplings and pushed with all her might. The canoe slid away and disappeared over the edge of the bank. Rebecca ran back to the other end again. Grabbing the bow she pulled it toward the water, backing up as she as she went. Fortunately the mud of the riverbank lubricated the bottom well. She moved into the cattails with it. As she moved into the shallows, the water buoyed up the canoe and made the task easier. Suddenly a surprise attack came from the water. She felt the fangs pierce her ankle and looked to see a snake with a coppery-colored head swimming away. Rebecca’s first thought was to get away from the Indians. She continued to pull the dugout canoe until she was sure it wouldn’t bottom out when she got in. She rolled over the gunwale and got to her knees. She paddled the canoe through the cattails to open water. When she reached midstream she decided to inspect the bite. She reached down and tore her stocking away, revealing two puncture holes now swelling on her leg. She had no way of extracting the venom by herself, so she committed herself to Providence and continued paddling. In a little while, she passed out in her canoe and drifted, unguided, down the Monongahela River.